Spoke to Steven about a kit for my old Volvo 760 and he could not be more helpful. Ordered the kit came the next day all is good in the world.Fantastic service very helpful would use again if needs be. I obtained replacement injector o-rings from my local official BMW dealer using the parts numbers from the ETK and they didn't solve my problem because they were not of the correct tolerance (even after i ascertained i need bosch and lucas parts). The local BMW dealer had no idea so was of no help. 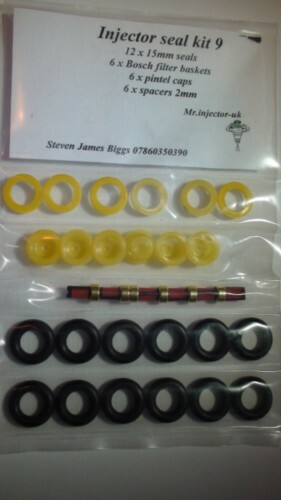 After this waste of time and money i found this website and Steven helped me confirm the actual it i needed - which as a whole kit was also cheaper than just the o-rings from BMW! Steven's help was invaluable and with the kit fitted my injectors (cleaned locally) once again fitted properly and my car ran great. I'm based in southern Spain and obtained the parts far quicker than the incorrect ones from BMW Spain. Obviously i recommend this product and service. I purchased this kit for my m3. The car had already had a professional incar fuel system clean and it ran better. I thought the fuel system was already perfectly clean and properly working but that was until I installed this kit in my injectors. In a few words: night and day!, its a totally different car, smoother idle, picks up revs faster... its like a new engine overall. Very happy with the results and the product.